My blogging of our journey retraces the journey in my mind. Winding, spiralling, webs of memories sometimes triggered by specific encounters, experiences, other times by powerful feelings emerging from deep within. Today I saw a group of people practising Tai Chi in Riverdale Park overlooking the sweeping Don Valley. A group diverse in age and race "waving hands like clouds" with slow, tranquil, intention ('man jing yi' in Mandarin). 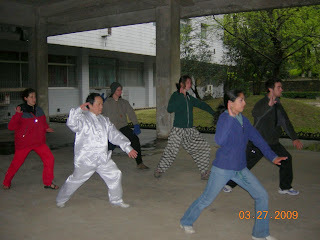 And I remembered Josh Tai Chi-ing throughout our journey. And living with 'man jing yi'.